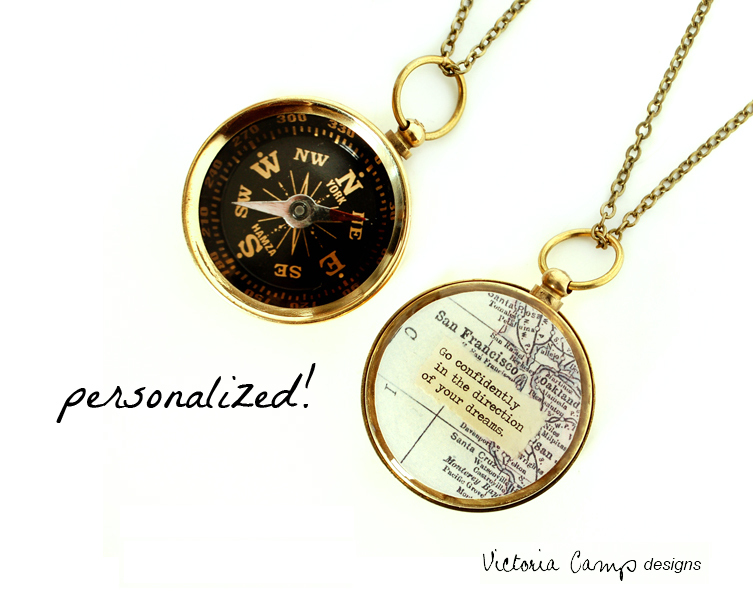 New Year – BuzzFeed Article Feature – and Custom Map Quote Compass Necklaces! Happy New Year! I know, I know, it’s February and I’m a little late to the 2014 game. I think it’s socially acceptable to wish someone a Happy New Year up until January 31st, after that, well.. what can I say? I spent the first couple of weeks of the new year catching up on orders from December, and then spent the last part of it working on a happy flurry of new orders, thanks to a Buzzfeed Travel list that included one of my designs! The article was titled “21 Things Every Traveler Wishes They Owned” and can be found here. 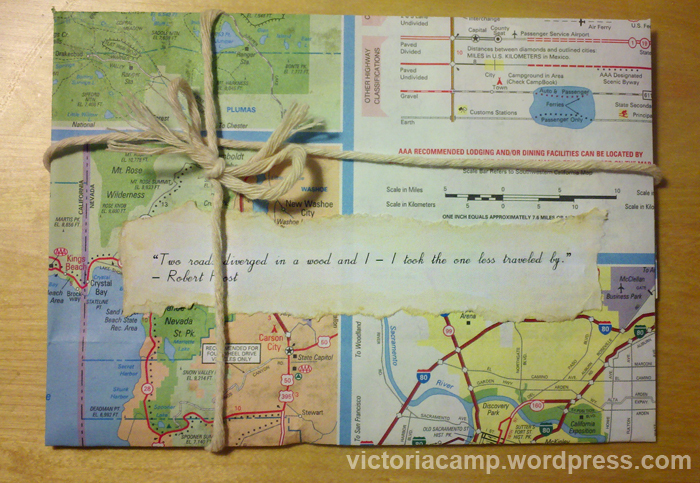 The quote on the back of the compass can be personalized with anything you wish – poetry, a special message, a birthday, etc. Yep, I liked it enough to take a picture of it before I mailed it! A picture of the GPS they would be receiving was tucked away on the inside of the envelope, along with a note. My mom called me and said how much she loved the envelope, and was carrying it around in her purse to hold coupons. She was so sad when it started falling apart, that I decided I needed to make her something a little more permanent that she could carry with her.. subsequently, I made her a compass key chain with the same design – a map clipping background, and the same quote on the same tea-stained paper. And with that, a new design idea was born! Lately, I’ve had a lot of requests to personalize the map behind the quote. I don’t typically do this, as I like to use maps cut from the same atlas used in the sample photos (it’s a vintage atlas with beautiful earth toned colors and really great fonts!) However, I do love to make my customers happy, so I worked on a design that does allow for a custom map in the background behind the quote/text area. Unfortunately I don’t have a lot of small towns available, but do have the major cities and large suburbs of most areas in the U.S., and major cities worldwide. 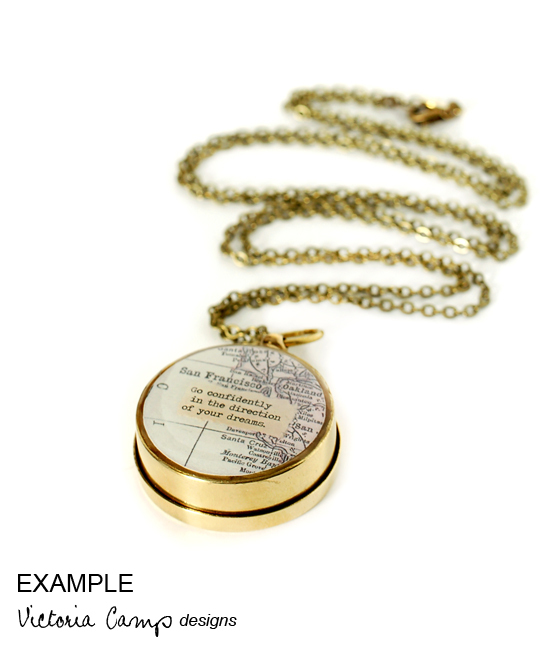 Both the map and the quote are protected under a hard glossy layer of jeweler’s resin, for a professional finish and durability. The sample shown is with a map of the San Francisco bay area. I’m using prints from my antique atlas collection for these – the atlases are nearly 100 years old! 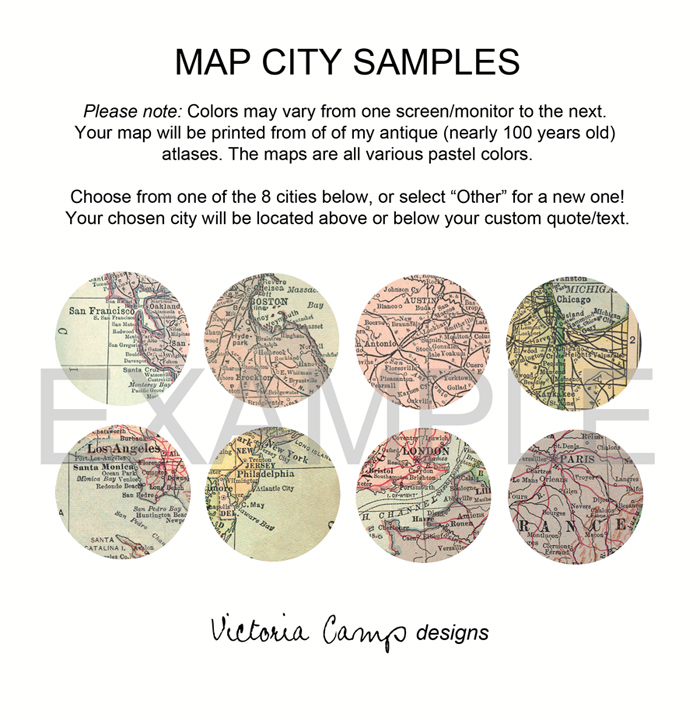 I made a samples showing 8 different cities, but you can of course request your own different city! Speaking of quote compasses, I need to go make some more tea-stained paper. Happy February! Oh, hello..yes, I am still on the constellation kick. I can’t help it – sometimes my mind is swirling with ideas and I just have to get them all made and physically held in my hands before I can move on to the next project. Work in progress: Why yes, I do mix my paints with toothpicks! (And often paint with them..it’s a strange habit I’ve had since my youth. You’d think I would just invest in tiny paint brushes already…) I kind of like the palette happening here.. I found myself spending the entire afternoon happily painting away. For some reason, painting puts me back into the memories of my grade school days. Perhaps I just never allowed myself the time to enjoy it as an adult. 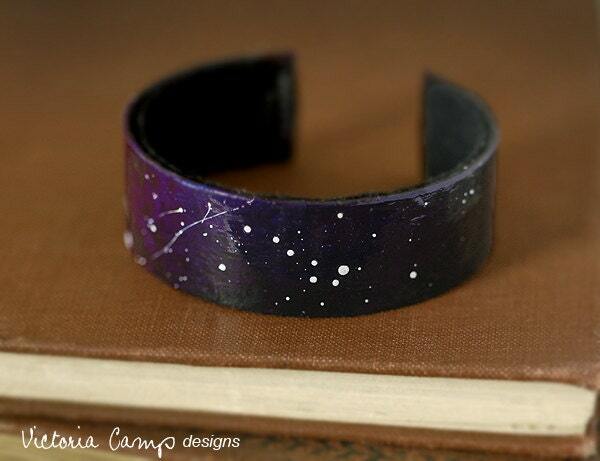 The first completed cuff featured the Ursa Major (Big Dipper) constellation. 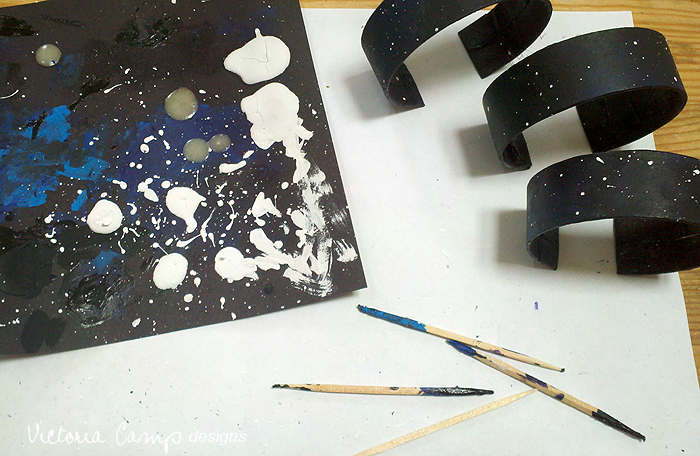 I painted a few more bracelets, but left a space in the center to add a custom constellation of your choice. After the constellation is chosen, I then follow a finishing process of sealing and protecting the cuff with three layers of various sealants, and a felt lining. Pretty awesome, right? These bracelets are available in my Etsy shop, https://www.etsy.com/listing/104265444/personalized-constellation-cuff-bracelet You can choose from any of the zodiac signs, Ursa Major, or if you have another choice just let me know! (I’ve already made one with Orion for a customer’s request.) These make great gifts for your friends, or something special for yourself.. perhaps the constellations representing yourself and a loved one?